THE COOTHA CLASSIC 30/31 MAY 2009. 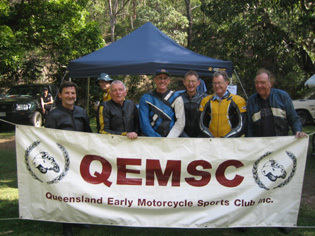 The idea of this weekend was for QEMSC members to help promote Historic Motorcycle racing in Queensland. I am sure we have done this, as the questions and feedback we received in the sidecar pit area was just fantastic. I am sure a lot of the public that walked through the sidecar pit area just wanted to meet and talk to the idiots that race these three wheeled machines. To see all those wonderful solo motorcycles. Manx Nortons, Triumphs, B.S.A.s etc and not forgetting that great collection of Kawasaki’s. 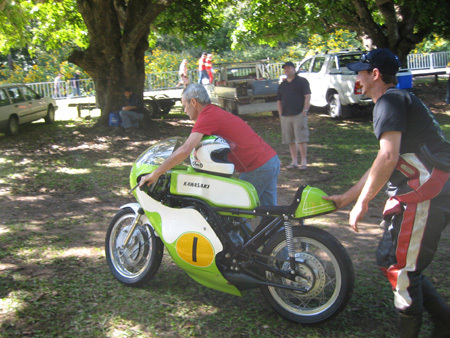 To see former World Champion Kork Ballington riding again would have brought back some fond memories for all of those people who have been following the GP bikes for some time. After our first run up the hill, I could see why they were not timing the motorcycles. It was like riding your machine down your hallway at top speed with no where to go if you got out of control. Armco on one side and concrete on the other. Not a lot of options for a wayward solo or sidecar. But seeing all those people watching as we motored up the hill, was indeed a great sight. It would be nice if we could get half that many folks to the Aussie titles meeting in September. Above all other things I think Ian Milton should be congratulated on a job very well done, along with all his helpers who I am sure there were many. There were a number of Police walking around during the weekend & all seemed to be very friendly. All those unregistered and loud motorcycles and not a ticket to be seen!!!. As for the cars, where I was in the sidecar pits was a great place to watch them all going by & also helped to pass the time. From the "Old Specials" to the Modern racing cars it was a sight to be remembered for some time to come. The historic Speedcars were of special interest to me after attending many Speedway meetings all those years ago. From the event director Bill Westerman to the Brisbane City Council, all e should be congratulated on a fine job. The hours, the days, the months that this event "The Cootha Classic" would have taken to put together would have been huge. I am sure from all the positive response this is going to be an annual event. Bring it on I say and I think I am speaking for all those folk competing and spectators alike. It was just a great weekend.